This Safavieh Courtyard area rug is sure to make a statement in any room of your modern home. Make your hallway, dining room, or living room more stylish with this indoor/outdoor plush synthetic rug. Since it is machine-made, you can trust the quality on this rug. Keep things classy, yet high-quality with this geometric patterned grey rug. Add this high quality Safavieh Courtyard area rug to your home for an instant splash of style. Bring this high quality plush synthetic indoor/outdoor rug into your home to upgrade your interior design immensely. Keep this machine-made made rug in your home for a long time. This solid patterned grey rug makes a contemporary mark on your home's interior design. 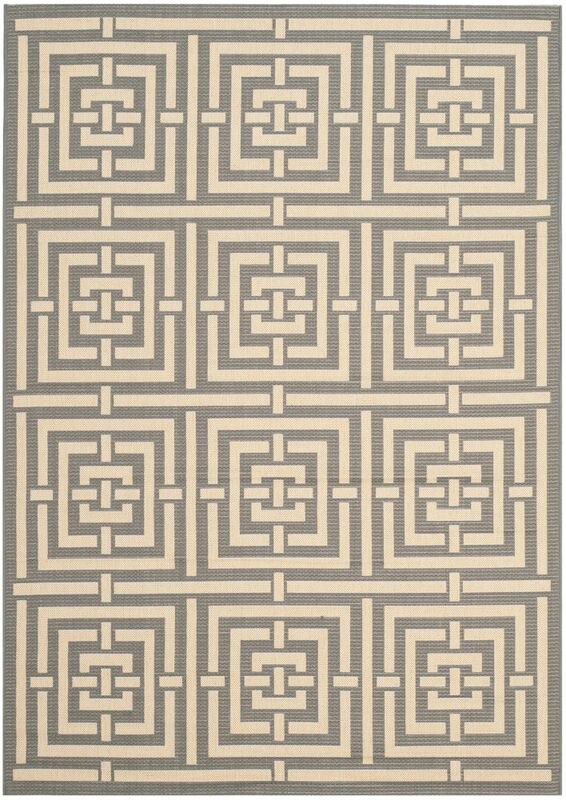 Courtyard Paul Grey / Cream 5 ft. 3 inch x 7 ft. 7 inch Indoor/Outdoor Area Rug This Safavieh Courtyard area rug is sure to make a statement in any room of your modern home. Make your hallway, dining room, or living room more stylish with this indoor/outdoor plush synthetic rug. Since it is machine-made, you can trust the quality on this rug. Keep things classy, yet high-quality with this geometric patterned grey rug.